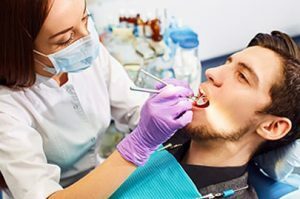 Few dental treatments strike more fear in the hearts and minds of patients than “root canals.” The distressing reputation of this procedure is not justified. It actually stems from pain caused by the underlying condition that results in need for root canal therapy. For more than two decades, Dr. Dean Dietrich has been helping patients in the Dolton, IL area keep their natural teeth. 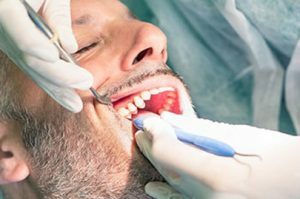 This story illustrates why root canals are nothing to fear and emphasizes the top reasons you should know why the procedure makes good sense. Mary is an energetic woman in her mid-40s. She enjoys outdoor activities with her big, enthusiastic rescue dogs. One day, Oscar, a particularly bouncy companion, was especially excited to see Mary head out the door for a hike. In his eagerness to get started, Oscar sprang upward when Mary reached down to clip the leash. His head came up under her chin and closed her mouth, suddenly and soundly. Mary rubbed her jaw and didn’t give the incident any more thought . . . for a long time. About a year later, Mary started to experience sensitivity to hot and cold beverages in one area of her mouth. She had a few old amalgam fillings there, so attributed the discomfort to the thermal conductivity of metal. Then a nagging toothache developed. It came and went, so it was fairly easy to ignore. Mary thought she noticed that one tooth looked a little off-color, but her teeth were aging too, right? This went on for a few more months. In the dark just before twilight Mary woke up with distinct pain in a lower bicuspid on the right side. She tossed and turned, but the pain prevented sleep. A cold compress didn’t help, nor did a couple of over the counter pain relievers. By daylight she couldn’t bite down without wincing. The gum seemed puffy and she had a strange taste in her mouth. After showering and dressing, there was noticeable facial swelling, and the pain was becoming nearly unbearable. Fortunately, Mary’s dentist allows time in his daily schedule to see urgent cases. Dr. Dietrich got Mary in the chair promptly and started root canal therapy. Job one was getting Mary out of pain. A few numbing injections brought immediate reprieve, giving Mary a lopsided smile of relief. Upon examination, the Dr. D. quickly ascertained that an old injury had created a hairline fracture, allowing harmful oral bacteria to make their way to the center of the tooth Where the nerve sits. This eventually caused infection in this area leading to the pain Mary experienced. Dr. Dietrich treated the tooth by starting root canal therapy. He cleaned the infected tissues from the tooth and placed medications to help eliminate Mary’s pain. He then placed a temporary filling and prescribed antibiotics and pain medications to assure Mary stayed comfortable. A week later the root canal treatment was easily completed as Mary snoozed through the appointment. A filling was placed and the tooth was prepared for a crown to assure it would be sealed properly (so bacteria don’t get back into the tooth) and to assure as much as possible the tooth wouldn’t crack more while being used. Usually the only alternative to extraction. Helps you keep a precious natural tooth. Gets you out of pain quickly. Removes the cause of pain. Since the tooth root remains, jawbone stays strong and dense. Avoids need for more costly tooth replacement procedures (fixed bridge or dental implant) in the future. Dr. Dietrich hopes you never have to experience what Mary went through before her procedure, but dental problems can happen. Isn’t it a comfort to know that, as his patient, you will receive the same personalized attention and gentle treatment that left Mary with a big, healthy smile? Call Pleasant Dental in Dolton, IL at (708) 576-1900 to become a patient. I hate the dentist! They staff is very professional and they have great customer service. I visited yesterday morning as a walk in and received the most professional services. The young dentist Dr.A made me so comfortable and at ease. He was gentle and discussed honestly what could be done to fix my tooth. I will be returning to have all my dental work completed there! Thanks to Dr.A and his staff.